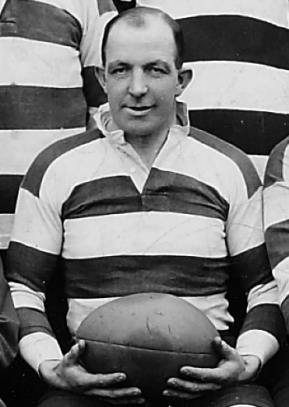 Les Saxby played 169 games for Gloucester between 1924 and 1932, scoring 30 tries. He started his career as a centre but moved to the back row and became pack leader. He captained the club for four seasons (1927-30 and 1931-32). He was an England international and Barbarian and was on the winning side in three successive County Championship Finals (1930-32), captaining Gloucestershire in 1932. Leslie Eric Saxby was born on May 19, 1900 at Bradfield, Berkshire. He played for Hereford from 1921-26 and captained the club. While with Hereford he played county rugby for North Midlands in the centre. In April 1924 while still with Hereford, he made his debut in the centre for Gloucester and played on their Easter tour. He was described as a student at ReadingCollege. The following season he played occasionally for Gloucester, referred to in the press as “the Hereford man” and played again for North Midlands. During the 1925-26 season (and now referred to as “ex-Hereford”) he tried to break into the Gloucester side at centre, but it was not until November 1926 that he made his debut in the back row. The Citizen said “Saxby was introduced into the pack…..With a better knowledge of the finer points of forward play the old Hereford player should prove a useful acquisition.” The experiment was an immediate success and within four months Saxby made his debut for Gloucestershire against Monmouth in the back row. Les Saxby captained Gloucester for the next three seasons, 1927-1930 and also played regularly for Gloucestershire. It was a period of success for both club and county. Saxby proved himself an outstanding leader and became an iconic figure in the club. 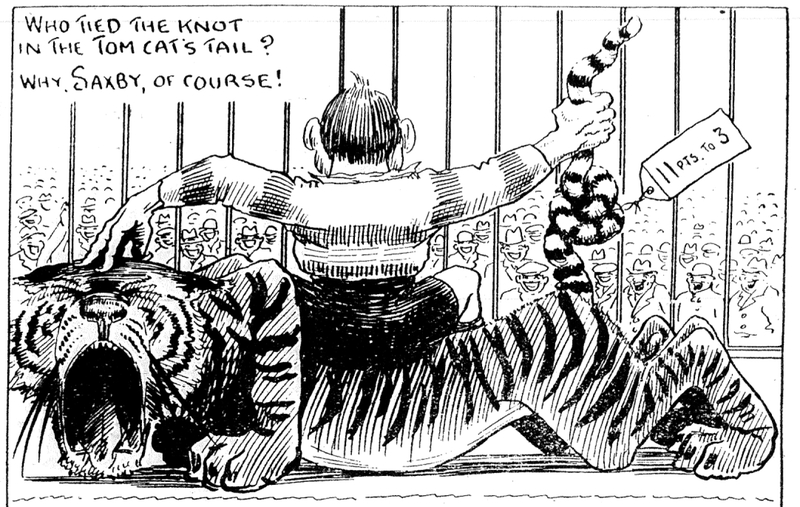 This is nowhere better illustrated than in a Teek cartoon which appeared in the Citizen on 19 January 1929 following an 11-3 victory over Leicester at Kingsholm. “On arriving in London on the eve of the great struggle, I found everyone else, like myself, keyed up to do their best. The Selectors were very helpful, having every confidence in the team, which was very inspiring. I cannot say how encouraging these “Big Men” are to the first-timer. They seem to make a point of not being “Big Men”, but just some of the crowd giving a few words of advice. One of them took his coat off and helped to rub the chaps down before the match. Just before the game one felt more and more the responsibility on one’s shoulders, and on seeing the crowds of faces on going out one’s first thought was: “Can I satisfy all these people as one of their representatives?” Then the cheering starts, and you feel you have their confidence and decide not to let them down. 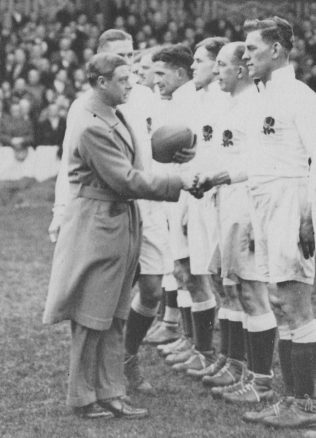 He also led the England pack in the following international against Wales at Swansea and went on to play for the Barbarians on their Easter tour of South Wales. The Barbarians won all four games for only the second time and Saxby featured in wins over Swansea and Penarth. Saxby had been chosen as Gloucestershire captain at the start of the 1931-32 season but was unable to play in the first game against Devon at Exeter. To the astonishment of press and public, the defending County Champions were soundly beaten by Devon who scored six tries in the process. Under Saxby’s captaincy, the situation was turned round however, and Gloucestershire went on to take the Championship for the third year in succession, beating Durham at Blaydon in the final. At the time of Les Saxby’s selection The Times reported that “he is one of the oldest forwards who ever received a cap towards the very end of his career” and the rumour persists today that he was close to 40 when he made his debut for England, although in fact he was not yet 32! Saxby enjoyed the joke. At an end of season dinner, his Gloucestershire teammates presented him with a silver beer tankard inscribed “To Old Man Sax”. Engraved on the tankard are the signatures of the 1932 Gloucestershire Championship-winning team. Saxby retired at the end of the season. Les Saxby joined the RAF at the start of the 1939-45 war and was posted to South Africa, where he was attached to the South African Air Force. He returned briefly to England at the end of the war before going back to make his home there. 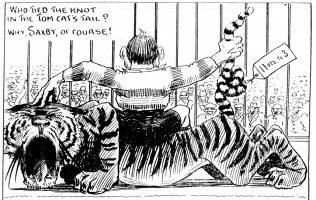 He died in Pietermaritzburg aged 58.